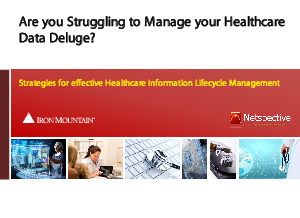 > Iron Mountain > Are you Struggling to Manage your Healthcare Data Deluge? There is ample evidence that healthcare organizations are burdened with a deluge of data and it’s only getting worse over time. Whether it’s provider-generated observational data coming through EHRs, or medical imaging and telemetry data, or patient-generated consumer device and genetic data, the traditional methods for managing health information do not scale. Newer government regulations, quality reporting, and future patient-engagement requirements reveal systemic deficits in today’s information lifecycle management (ILM) approaches. Given the enormous and ever-increasing value of healthcare data, new approaches to enterprise ILM are essential. And, with scarce resources limiting your ability to “do it yourself” you’ll need the right partners that understand and implement these new approaches.